Paleontologists and geneticists, such as Olaf Bininda-Emonds pictured here, have been working hard over the past year to understand the evolution of placental mammals, sometimes coming to different conclusions. Not only does the Cretaceous-Tertiary (K/T) boundary at 65 million years ago mark the widespread extinction of dinosaurs and other ancient species, but it also signals the beginning of the so-called age of mammals, a time when the furry, warm-blooded creatures — especially placental mammals such as primates, carnivores and rodents — exploded onto the scene. At least, that’s what the fossil record seems to say. But in recent years, molecular biologists have turned to DNA to help better understand the mammalian family tree, and these molecules appear to tell a different story, suggesting placental mammals radiated much earlier. In 2007, two large-scale studies added to the debate over when modern placental mammals first began to evolve, with each coming to a different conclusion. On March 29 in Nature, Olaf Bininda-Emonds of the University of Jena in Germany and colleagues published their “supertree” of mammals, a compilation of thousands of previously published evolutionary trees based primarily on molecular data. To determine when different branches arose, the team used a relaxed molecular clock approach. They examined DNA sequences, comparing mutations between different species. Using fossil dates to calibrate their molecular clock — and assuming mutations occur at a relatively constant rate over time — they estimated how long it took for these mutations to accumulate between different species, or in other words, how long ago two species last shared a common ancestor. The team found that the major orders of placental mammals emerged during the Cretaceous — sometime between 100 million and 85 million years ago. Things stayed fairly static until around 50 million years ago, when there was another major burst in speciation, and different groups within these orders, such as cats and dogs within the carnivores, began to branch out. This isn’t the scenario that John Wible of the Carnegie Museum of Natural History in Pittsburgh and colleagues reported later on June 21 in Nature. In their study, they announced the discovery of a new species of Cretaceous eutherian, a group of mammals that includes placentals and their close relatives, from Mongolia and presented the largest evolutionary analysis of eutherian fossils from this time period. Based on hundreds of morphological features, their results show that none of the currently known Cretaceous forms belongs to any of the modern placental groups, supporting the traditional stance that these groups first diverged around the K/T boundary. Geotimes reporter Erin Wayman discussed the lack of agreement between these studies, and others like them, with both Bininda-Emonds and Wible. The discovery of this tiny fossilized skull of a new mammalian species in Mongolia, led John Wible and colleagues to undertake a large evolutionary analysis of Cretaceous mammals and modern placental mammals. EW: Why is there a disparity between what the fossil record says about mammalian evolution and what the molecular evidence suggests? OBE: There’s actually a whole bunch of explanations. The obvious and immediate one is that [paleontologists] simply haven’t found the fossils yet. Even the paleontologists will admit all it takes is one fossil to overturn all of the fossil evidence up until now. If they suddenly find a cow, a deer or a wolf-like animal from before the K/T boundary, the paleontologists [will] have to rethink most of their hypotheses. Part of the problem is [that] a lot of paleontologists have been searching very hard and very long for these fossils. They simply do not seem to be there. That’s not to say that they still might not come. Another problem — at least on the paleontological side of things — is that the data are very much open to interpretation. A lot of fossil finds that they do have are of fairly poor quality: Much of the fossil is missing; the fossil has been crushed, impacted [and] transformed; and it takes a lot of interpretation to figure out what it is ... Paleontologists do think there were quite a few mammals in the Cretaceous during the time of the dinosaurs. [Some paleontologists think some of these mammals were placentals, perhaps even members of groups present today.] Other paleontologists disagree with that assessment completely. A final limitation with at least the fossil data is that any fossil calibration data is almost without exception an underestimate because the fossil record isn’t perfect. That means you’re unlikely to find the oldest rodent fossil. JW: Not all molecular dates are the same. There’s an incredible range of placental divergence dates. They all happen in the Cretaceous, but you have a deep date of about 130 [million years] and young dates of about 80 [million years]. That’s nearly 50 million years of time that those molecular dates diverge over, so you can’t just say all molecular dates are created equal. If you compare our scheme of divergence around the K/T boundary [to 130 million years], then you have a big disparity. On the other hand, if you compare ours … to 80 [million years], then it’s not that far off. All morphologists basically use the same kind of methodology in reconstructing phylogeny, so they can be compared against each other. Not all molecular systematists are using the same methods, which may explain the broad range of divergence dates. They need to use fossils at some point to come up with a concept of time and not all of them are using the same fossil dates. So that’s another place where discrepancy might be introduced. Another thing is they don’t all use the same genes or the same taxa, so there’s a variety of places where there’s enough variability to account for the range of dates they’re coming up with. EW: Should the morphological and molecular data match up? Are both types of evidence equally important? JW: I think the idea is that there’s got to be some sort of coupling between the molecular and morphological dates. OBE: Both pieces of data in my mind are equally valid. My training is actually as a morphologist, and I’ve sort of wandered more to the molecular side of things simply because it is much easier to generate molecular data these days. Both are equally valuable in terms of informing us of the evolutionary relationships of organisms. They’re also checkpoints for one another. EW: Do you foresee any resolution between molecular and morphological data anytime soon? 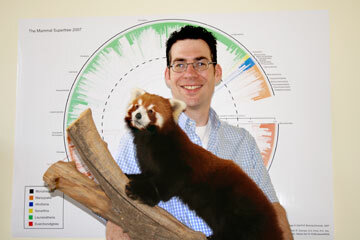 What more can researchers do to further examine this period of mammalian evolution? OBE: The paleontologists are already doing their part. They’re going out there and digging wherever they can, trying to find these mammals. If they keep digging for 20 years and find absolutely nothing, that’s a good indication that the mammals were not there. On the molecular side, it’s also a case of collecting more data. We used 68 genes to date the tree. There’s a whole bunch more genes out there to be looked at. So in both cases, it’s a matter of collecting more data and piecing through the data to try to decide how solid the different pieces are. JW: I’m part of a large consortium of researchers that are funded currently under the Tree of Life program at the National Science Foundation. Our group has two sides — the morphological side and the molecular side. There are probably about 30 people working on this. We can look at our [recent] morphological analysis … as sort of a starting point and expand it. Then the molecular team is going to look at the same taxa we’re looking at on the morphological side. The ultimate goal is to combine all that evidence together to come up with something closer to the truth for the phylogeny of mammals. It’s an analysis of this scope that will ultimately provide the best test for the divergence of placental groups. Scientists studying extinct species are increasingly relying on DNA to learn more about population dynamics and the processes of extinction and colonization. 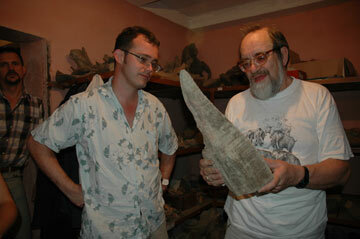 Geneticist Ian Barnes, left, discusses a woolly mammoth bone with his colleague, Andrei Sher. These days, DNA analysis is used in a variety of scientific fields, and paleontology is no exception. In 2007, researchers relied on ancient DNA — DNA recovered from fossils — to study a variety of long-dead animals, including mastodons, woolly mammoths, ancient gray wolves, cave bears and arctic foxes. One thing these studies have shown is that studying the genetic code can reveal much more than just who’s related to whom. It can also help researchers better understand how populations change over time, teaching us more about the processes of extinction and colonization. Ian Barnes, a geneticist at Royal Holloway, University of London in the United Kingdom, has been using ancient DNA to track extinct woolly mammoth populations across Siberia and North America (see Geotimes, August 2007). 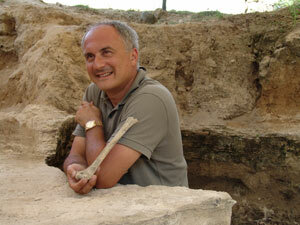 Geotimes reporter Erin Wayman talked with Barnes about the value of ancient DNA. EW: What sorts of questions are scientists trying to answer by studying ancient DNA? IB: What we — a few colleagues and I — have been looking at over the past few years is the tension between two of the main ways we’ve been looking at the past. One of them is the fossil record and the other is a technique called phylogeography. This is basically just looking at some section of DNA — typically mitochondrial DNA — in a set of populations for a particular species in a geographic region, looking at how different genetic types correspond to the locations where you find them. For example, if you find two populations have very similar genetic types and are geographically close to each other, then you can kind of assume one of them is essentially an extension of the other. EW: Where does ancient DNA fit in? IB: In my opinion, the strength of DNA and where the most interesting work has been going on now are the situations where we’ve got some idea what’s going on from phylogeography and some ideas from the fossil record, and we can go in with ancient DNA and use phylogenetic techniques and go back and directly test stuff using paleontological material. The other place where it becomes very interesting is when we’re able to look at [species] that are now extinct and have been extinct for a very long time. EW: What are some examples of using ancient DNA for these purposes? IB: For me, the most interesting stuff has been happening … in parts of northeast Siberia and Alaska and parts of Canada. Because of the way glaciers formed during the last ice age, that whole area was unglaciated and was sort of a refuge for many of the classic ice age mammal species, like woolly mammoths or woolly rhinos. There’s a series of papers looking at just how the animals that lived in that region migrated across Siberia and Alaska, how they responded to the environmental change that was going on at that time and what the underlying dynamics of the extinction process and colonization process are. EW: What have these studies taught us so far? IB: What we keep finding again and again with bison, with brown bears, less so with the mammoths but to some degree, is that things seem to be very dynamic — there’s a lot of turnover, there’s a lot of change in animal populations. The species are there, but they’re constantly going extinct in a region, and there will be some period when they’re not present and then they’ll turn back up again, and there’s recolonization from a different area. I think it’s probably the single thing we hadn’t realized and hadn’t really thought about until these data started coming through. EW: Is this unique to this time period at 50,000 to 10,000 years ago, or is it a trend that maybe we just can’t see today because of our limited time scope? IB: I think it’s probably some degree of both. What’s always difficult to conceive is that we’ve actually got a long time period here. I’m sitting here looking at the data, and everything’s turning over very, very quickly — of course, this is over a 40,000- to 50,000-year time period. One of the advantages of working with ancient DNA is we do have this kind of enormous timescale to look at. This gives us 50,000 years of a species’ history to examine and as we do more and more work, we’ll pick up more and more detail about how it changed during this time. The other thing is we’re looking at a really, really interesting period in Earth’s history. Part of the reason we’re seeing so much turnover is because we’re looking across an ice age. To some degree, it’s very, very difficult for us to follow exactly what’s driving each species’ extinction. That’s probably the big challenge for the future: Why do mammoths expand at this particular point in time? Why do brown bears go extinct in an area at 35,000 years ago and then somehow recolonize [it] at 20,000 years ago? EW: How can researchers tackle these questions, and what can we expect in the future? IB: It’s actually pretty much what we’re doing now. It’s just a case of getting more and more data, doing more and more sampling and getting more and more sequence data for each individual. The amount of DNA we got from one individual when we did our brown bear work was a few hundred base pairs. I can see the standard in the next five or 10 years will be the entire mitochondrial genome of 16,000 base pairs. EW: When you talk to people outside of the field, do you find there are misconceptions about the kind of work that you do? IB: Yeah, there are a lot of those. [chuckles] I can’t remember how many times I was asked, “What caused the mammoth extinction?” I guess it was really just naiveté on my part, but I hadn’t really thought about it. The notion that we’re not really interested in the final extinction — we’re interested in the 50,000-year buildup to that — I think is something that I have to sell a bit. Obviously, “Can you clone a mammoth?” I get quite a lot. We’ve always said no. But I realize the technological advances I’ve seen since I started doing this type of work 10 to 15 years ago have been amazingly huge. So, who knows? Maybe we could clone a mammoth. But I don’t know where I’d put one. David Lordkipanidze and colleagues discovered a variety of fossils in Dmanisi, Georgia, that reveal new details of early Homo’s body. Here, Lordkipanidze compares one of the fossilized upper arm bones to his own. Exactly how humans evolved from the small, ape-like australopithecines into the tall, lanky species of our own genus Homo has long been an important question in paleoanthropology. But interpreting the variable, somewhat limited evidence of early Homo hasn’t been easy. “When viewed up close … the Australopithecus-Homo transition has always been murky,” paleoanthropologist Daniel Lieberman of Harvard University wrote in Nature Sept. 20. This year, however, two new fossil discoveries provided researchers with some clarifying clues. The Australopithecus-Homo transition began sometime between 2.5 million and 2 million years ago, as evidenced by the appearance of Homo habilis, the first member of the genus Homo, in the fossil record. By 1.9 million years ago, some researchers say, this species evolved into Homo erectus. This summer, Fred Spoor of the University College London and colleagues challenged that view with new fossils from Kenya’s Lake Turkana basin. The new Homo erectus skull also gave researchers a new perspective on that species’ variability. 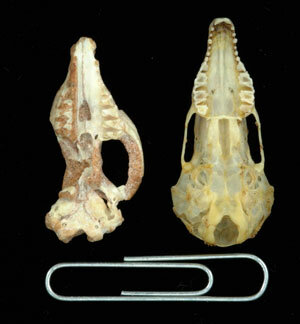 Although the skull shows clear signs of being Homo erectus, it is exceptionally small. If the skull belonged to a female, the researchers suggested, the species may have displayed a high degree of sexual dimorphism, meaning males would have been substantially larger than females. Previously, researchers had believed that Homo erectus, like modern humans, had a low level of sexual dimorphism (in humans, we tend to think of men as being larger than women, but our size differences are small compared to gorillas, for example, in which males are nearly twice the size of females). This new interpretation, however, now suggests the species may have been more primitive than previously realized. New fossil finds in Dmanisi, Georgia — home to the world’s oldest-known hominins found outside of Africa — also expanded the view of early Homo this year. David Lordkipanidze of the Georgian National Museum and colleagues discovered arm, shoulder, rib, leg and foot bones dated to 1.77 million years ago. Offering a rare glimpse of the body of early Homo, the fossils reveal a mosaic of modern and primitive traits. Although the bones reveal that these early members of Homo had a small stature, they also indicate they had quite modern limb proportions with long legs and arched feet built for long distance walking, Lordkipanidze and colleagues wrote in Nature Sept. 20. However, these hominins had a relatively small brain given their body size and a fairly primitive orientation of the arm. The fossils at Dmanisi may represent an early extension of Homo erectus out of Africa, or an entirely different species of Homo, according to Lieberman. In his estimation, these new fossil discoveries reveal the variable, transitional nature of the earliest members of Homo and highlight how much we still have yet to learn about who these hominins were. If you follow the latest human evolution news, you might have noticed the term “hominin” has replaced the term “hominid” in reference to our ancestors. The change is just a matter of taxonomy. The term hominid refers to the family Hominidae to which humans and our closely related ancestors, such as Australopithecus, belong. Recently, however, thanks in large part to genetics, researchers have been reevaluating primate classification. Because of our close relationship to orangutans, chimpanzees and gorillas, some taxonomists place these apes in the Hominidae family, meaning the term hominid now refers to both great apes and humans. Hominin refers to the tribe Hominini, a subgroup within the Hominidae family, which consists of humans and our close ancestors, or basically everything that used to be just a hominid. Thus, to clarify when referring just to humans and our close ancestors, the more specific term hominin is necessary.